Galvanized Cable – Aero Assemblies, Inc. Individual wires, strands, or the cable as a whole may be treated with zinc for improved product features and longevity. The process enhances both the internal properties of the underlying steel and creates a protective exterior layer. Galvanized steel cables are popular in applications where extreme atmospheric conditions such as temperature and precipitation may otherwise decrease the functionality of wire ropes. Construction, aeronautics, mining, marine, utilities, communications, automotive, and many other industries frequently use galvanized cable in support and control features. Stainless steel cables are also popular in these applications, though galvanized cables are an economic alternative that boast similar properties and features in less caustic environments. It is important to take environmental and mechanical stresses into account when selecting the proper galvanized cable. Further considerations include the overall size and diameter, breaking strength, design, and ductility. Some uses for galvanized cable may also require the use of fittings, fasteners, or other hardware which allow for connectivity and may prevent fraying of the rope. These components may or may not be galvanized dependent upon the requirements of their intended use. 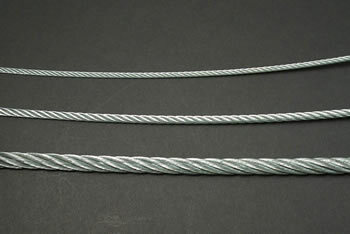 Along with wire rope fittings and other connectors, galvanized cables are composed of three basic parts. Wires are often cold drawn metal filaments of a relatively small diameter. Two or more of these are braided or twisted into a grouping known as a strand which in turn is helically wrapped around a core. Galvanization is often a post-forming process but can be performed on wires, strands, or completed ropes. 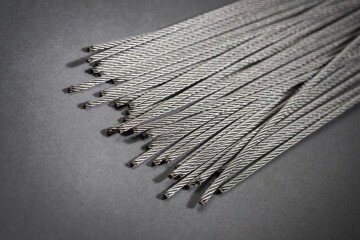 The traditional method for galvanizing wire rope is known as hot-dip galvanizing or hot-dipping. Cables, or components, are first cleaned with a light acidic solution before being fed or submerged into a molten zinc bath, heated to around 860°F. The zinc chemically reacts with the iron or steel forming a permanent bond with the substrate. When removed from the bath and subsequently exposed to atmospheric oxygen and carbon dioxide the zinc is cured and forms a protective layer of zinc carbonate. Electrolytic-galvanizing may also be used for a thinner, more tightly bonded coating made possible by passing an electric current through the zinc compound. Additional methods include coating the cable with an organic solvent that evaporates while the zinc reacts as well as coating the cable with zinc powder before processing in a rotary oven. Depending upon the method and specific requirements of a given application, steel cables can be coated with one or more layers of zinc in order to improve strength and corrosion resistance. The thickness of these layers most often ranges between one mil and just over four mils. Galvanized Cable Galvanized cables are wire ropes that have undergone a metallurgical process known as galvanizing to increase corrosion resistance, durability, and temperature resistance.